Another pictures related to the low cost iPhone spotted online on a Chinese website. 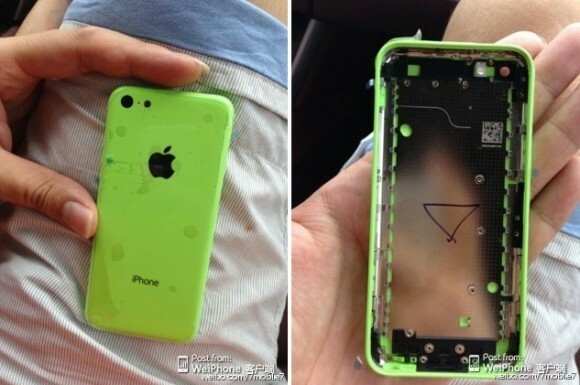 But this time, the pictures showed the back of the iPhone which appears to be in parrot green color. The images show a full back body of the device that usually covers the whole iPhone except for the front screen. The first thing to notice here is the green color of the phone. Clearly this is a very bold move by Apple moving from their traditional black silver combination and white phone to such a colorful device. We have also heard that this green color is just one of up to six color options that we are expecting from Apple that it would release the low cost iPhone in. When we look closely at the back cover, we can see few things. First there is the obvious space for the camera and the LED flash right next to it. It means that the camera will have a flash indeed and will be a good phone with much decent camera to take occasional pictures. Then there is the lightning connector port space at the bottom that also confirms that the low cost iPhone will have the same port as the iPhone 5. We can also see spaces for the side buttons that include the volume rocker keys, the camera button etc. This is not the first time we have seen the low cost iPhone pictures in the wild. Things have been going pretty well for the new low cost iPhone, normally named as the low cost iPhone 5 but we still have to see which name Apple chooses for the device. We can also see a new series of low cost devices from Apple and this might be the start of it. So, this set holds many unanswered and amazing queries that can only be solved as the time passes by. We still need to see dates for the low cost iPhone and the pricing details. Let us know what you think about the low cost iPhone and the color options for it. Do you think people will fall for the green iPhone, leave comments down below and share your views with us.